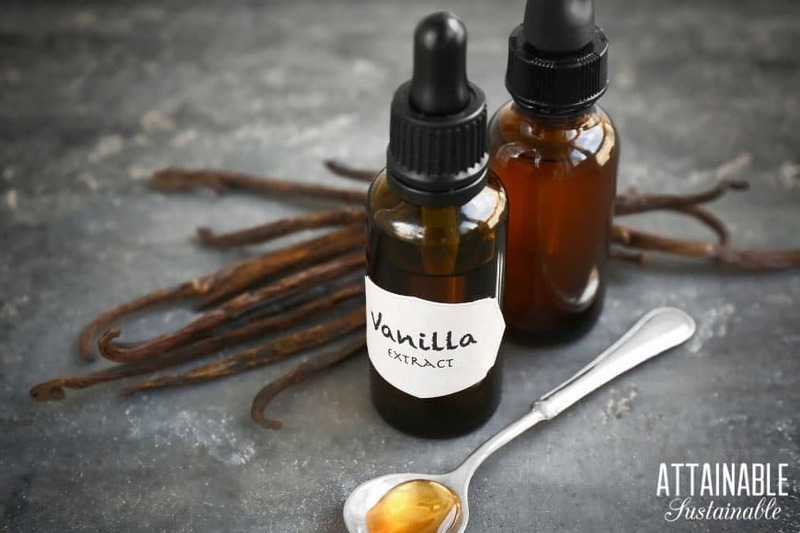 Whole vanilla beans and booze are all you’ll need to make your own vanilla extract for baking. This recipe is super easy to make and much less expensive than buying commercially made extract. Here’s how it goes at our house: Plan to make my own vanilla, but forget. Then my husband (the baker in the family) sees that we’re low. He picks up a big bottle at Costco, perpetuating a vicious cycle. Every bottle we get from the store? That’s one more piece of plastic that we have to figure out what to do with. How ridiculous to buy an imported version in plastic! Even if you don’t have access to a locally grown crop, it makes sense to make it yourself. 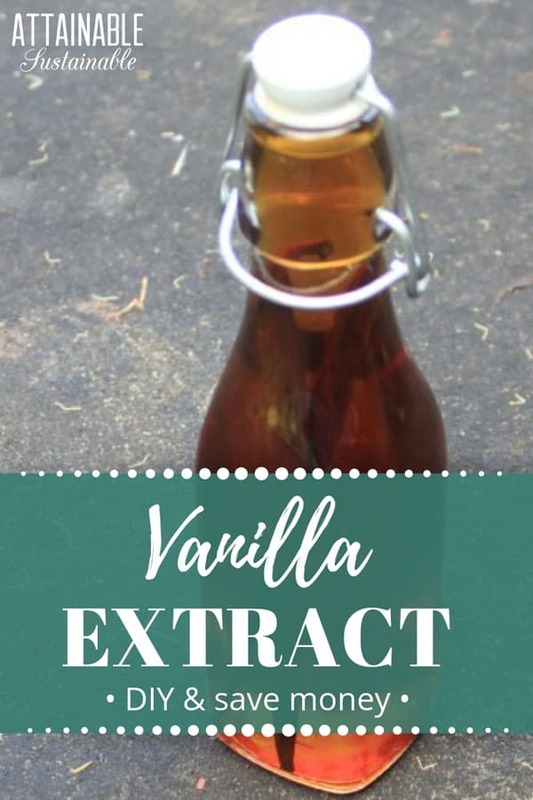 It eliminates waste, plus a single batch of homemade vanilla can last indefinitely, since you can keep topping off the jar as you use the vanilla. Inspired to try to make your own? Here’s how you do it. It’s not really a recipe so much as it is just putting a couple of ingredients in a jar. Then waiting, of course. Once it’s ready, you’ll be off and baking. Use your homemade extract just as you would the store-bought version. Stir it into homemade yogurt, sugar cookie dough, or this tangerine jam with ginger and vanilla. This recipe would make a great gift for your favorite, baker, too! Package it up in pretty jars, tie on a ribbon, and print out several easy recipe cards to go with it. This homemade extract is super easy to make and will save you a bundle of money. Split vanilla beans down the center with a knife or scissors. Slip the beans into a recycled glass jar or a canning jar. Use a jar that holds two cups of liquid. Pour vodka into jar and allow it to sit for three to four weeks. Don’t forget that when it gets too full of vanilla beans, you can pull out old bean casings and use them to flavor your sugar. Just toss them into a sealed glass jar with sugar and you’ll have gently vanilla flavored sugar in no time. Two for one! Kris, I must admit I read the title of your post and thought, “Yeah, right.” Make vanilla?! I had no idea it was as easy as this! How very, incredibly cool. I bet it tastes so much better than store-bought as well. I will definitely try it. Thanks! Lisa, funny. I do aim for *doable* projects. Thanks for sticking with me and realizing that it’s so easy! Thank you! I usually buy high quality vanilla but use it quickly! would you recommend a top shelf, well, or cheap vodka? You can also make this with rum. If you make it with rum, use a good rum. If you make with vodka, it matters less. Elaine, honestly I don’t know if it makes a difference. I used cheap, because, well, I’m cheap! The vanilla smells just divine. You have a vanilla farm down the road? How cool is that?! I second the suggestion on the vanilla sugar. Yummy on toast! It is very cool! I actually want to try to grow some myself, but that’s still to come. I had no idea it was this easy either. You’ve inspired me to give it a try! Wow thanks for this post. I will totally make my own. I had no idea it was so easy. Will buy some pods asap. I had no idea it would be this easy. Wild. Seriously. Wild. I had no idea that this was even possible! How cool! Who knew it was that easy? Thanks for this. I’ll give it a go. That’s all? Really? So easy! My MIL bought me a “kit” for this once. It always seemed as if the vanilla did not taste as good as the stuff I buy from Penzey’s. Any idea why? I’m going through an ‘I don’t like vanilla’ stage so I’m omitting it when I see it in recipes. That said, I think this is a wonderful idea. My mom used to make her own flavored vinegars. I’ve been meaning to try that myself. So cool! Who knew???!!! I love your “vicious vanilla cycle.” I buy organic vanilla in bulk (I think it comes from Madagascar) and bring my own glass jar so I don’t have the plastic or Costco issues. But I want to try this! I think my kids will love doing it too. @MyKidsEatSquid, how can anyone go through an I don’t like vanilla stage?! Shocking!! I had no idea it could be made so easily, everyone says. As for me, I had no idea it was all alcohol! I bought one of those kits and it says to let it soak for 4 months…I haven’t opened it yet but it gets darker as time passes. I’m waiting until I run out of store bought to open. The package says the bean can be used to make 2 recipes…we’ll see how it turns out. Thanks for sharing! made this and love using it- and it is such a conversation starter when I bring it out if I am cooking in front of friends. And when you tell your friends about it – and how easy it is – you might have another convert, thus diverting one more plastic bottle from the landfill! I made my own vanilla extract 2 yrs ago after reading this post. It has been wonderful and now I am making bottles for family for x-mas. My question is for others who have done this for several years. Mine is ready for new beans. Should I strain out the old tiny seeds from the bottom of my bottle, or leave them in there and just add the new pods? Good question. I’ve added a second bean/booze to mine without cleaning out the jar, but I usually rinse it after that. I don’t know if there’s a “right” answer, but that’s what I do! I buy beans in bulk off Amazon cause they’re much cheaper. At first, I stored them in the freezer until I needed to make extract, but eventually… basically, I put a bag of them in a quart sized jar and fill with vodka (or Everclear when I have it, but it’s illegal in PA, so depends if I’ve been shopping in MD lately). I didn’t even cut them, on the theory the alcohol would extract stuff eventually anyways. I pour that into a more normal sized container for actual use, and like you, top off the original bottle. With the one batch of beans, I’ve had my extract going for 2 years now. It’s still darker and more flavorful than the stuff you buy in the stores. I wish I had a vanilla farm right down the road! So I’ve got a bottle that someone gave me and I’m about half way through. Can I take the beans out and start a new bottle with them? The old bottle will be fine for using right? Would you try whiskey, or would that be too flavorful? That’s usually the only liquor in our house. I love this and want to make my own. 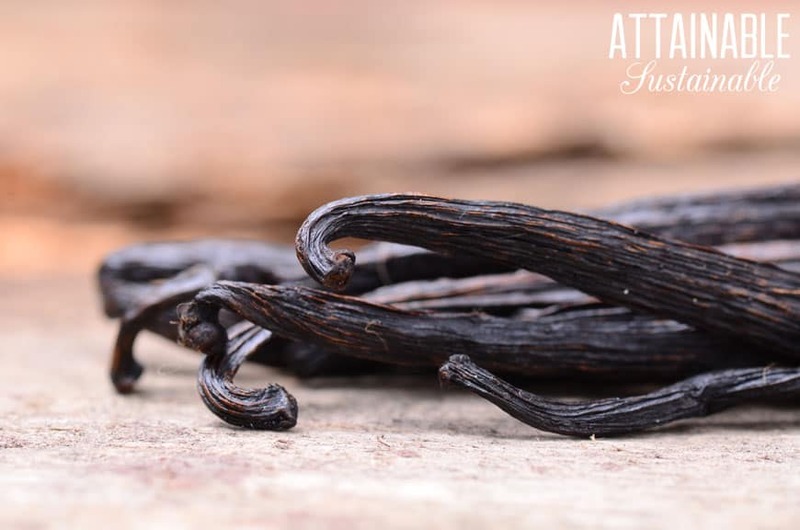 How do I know where to get good quality vanilla beans? I’ve seen them at world market, whole foods, grocery stores. I honestly don’t know how to tell a “good” bean from a bad one. I’m feeling like making sure it’s *fresh would be more important. So easy to make. I will definitely make this again. Great recipe. Just bottled my first batch. Is it normal to still be quite alcohol ‘tasting’. I’ve only ever used store bought. It tends to mellow as it matures. It IS alcohol, though.